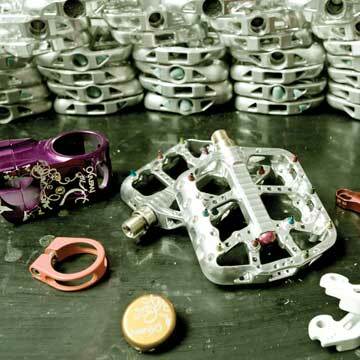 Twenty6 Products, LLC, of Belgrade, Montana, has an international reputation for producing rugged, take-no-prisoners, high-end mountain-bike components that are designed, engineered, and CNC-machined to win – with style! Twenty6’s superb finish, quality, and character are instantly recognizable in graceful two finger handbrake levers and seat-post clamps, elegant stems and bar ends, and classy no-slip, no-maintenance pedals – in at least 12 incredible colors. Tyler Jarosz, the brains behind Twenty6 Products, does it all. From concept to anodizing, every Twenty6 product carries his fingerprints. 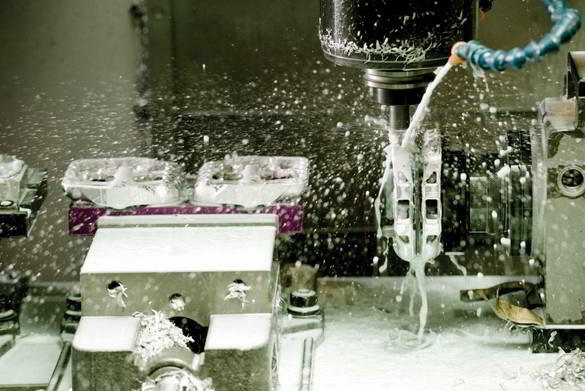 He machines his designs on two Haas VF-2 CNC vertical machining centers and a Haas SL-10 CNC lathe – which he also programs. And he personally tests his creations on his own track, just outside his shop, several times a day. “The most difficult product to machine is the pedal,” he continues. “That’s because of the many tool paths and contouring.” The Twenty6 Prerunner pedal is wide, with intricate structural features, and a slightly concave surface for grip. Aluminum traction pins screw into the pedal, ensuring a reliable, nonslip contact with footgear. Pedal axles are available in Ti-6Q2 titanium or 4140 chromoly steel.